Jigsaw puzzles in living motion right on your computer! One of the most popular games of all time has just evolved to a new level of excitement! 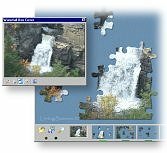 "Living Scenes Jigsaw Puzzles" is a fascinating collection of full motion, computer jigsaw puzzle games on CD-ROM. Each Living Scenes jigsaw puzzle is a highly realistic, true color, action puzzle that will immerse you in puzzle heaven for hours. The CD-ROM includes 12 Living Scenes puzzles and 12 bonus still image puzzles. You can even create your own computer jigsaw puzzles using any computer image allowing endless puzzling pleasure. However, be warned... once you have played a Living Scenes action jigsaw puzzle you may never be able to go back to ordinary, static jigsaws again. Buy your Living Scenes Jigsaw Puzzles CD today and see for yourself. And remember, Living Scenes Jigsaw Puzzles is a truly unique gift idea for that special person on your shopping list! "...you will love Living Scenes Jigsaw Puzzles... It's a winner!... Buy it!" The software in Living Scenes Jigsaw Puzzles greatly increases the excitement and enjoyment of computer jigsaws by introducing the dimension of motion. For example, our Living Scenes waterfall puzzle shows the flowing cascades of a waterfall splashing down into a rippling basin. You actually see and hear the continuous flow of the waterfall in the puzzle pieces as you play! Each puzzle piece depicts its own portion of the beautiful scene in motion. The motion of the scene often provides additional clues for piecing together the puzzle. This use of motion as a clue is a new tool for the jigsaw puzzle enthusiast that can not be provided by ordinary jigsaw puzzles. Not just any pretty picture makes a good jigsaw puzzle game! The subjects of our puzzles have been carefully selected to provide a fascinating and enjoyable puzzle game experience. Each jigsaw puzzle can be divided into any number of pieces you choose. 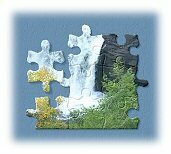 All of our color rich puzzles use sound and active lighting effects on a blue leather background to create a completely immersive jigsaw puzzle environment on your computer. The Living Scenes jigsaw puzzle software includes four independent drag-and-drop table tops, a box cover image panel, magnifier, and many other features. All this and more is waiting for you now! Buy your copy of the Living Scenes Jigsaw Puzzles CD-ROM at no risk. You may also download the 30 day trial version of "Living Scenes Jigsaw Puzzles" which includes one Living Scenes puzzle and two still image puzzles. Start having some real jigsaw puzzle games fun on your computer today! Copyright © 2002-2017 Carolina Road Software L.L.C. All rights reserved.